The Glock photo shoot began by examining the company products. I spead out samples while testing for color, texture, and a theme for the company. The bright primary colors of the gum balls projected a fun and festive atmosphere. I took several high resolution photos and widdled them down to the sampling seen here. 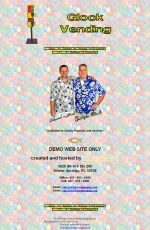 The gumballs became the background of the site. I had to tone them down through fill and transparency control so they would not overwhelm objects in the foreground. I had the company owners pose for a photo. See the full story below. The remainder of the site was designed around a "fun" atmosphere with generous use of color and animation throughout the site. The Glock Vending project may very well be the most fun I had on any design job and certainly the most colorful. The Glock brothers operated a vending service in the Central Florida area. 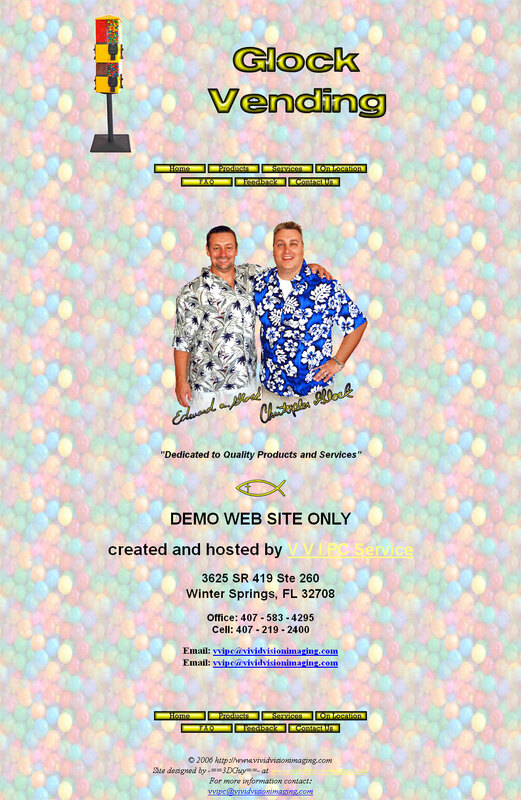 They contracted me to design a website for their business. The first thing I did was to schedule a photo shoot with them. When I design a site for a business, I need to know the personality, the flavor, the attitude of the business which often mirrors the owner(s). I arrived carrying my lights, extension cords, tripods, reflectors, and cameras. We took a few test shots of the products. Then we laid out samples of the product so I could test the textures and colors. Right off the bat, the bold primary colors leaped out at me. At my suggestion, we covered a table with 1,000 gumballs. I positioned the camera over the table looking down and shot some great hi-resolution images that eventually became background for the site. The Glock brothers were using the U-Turn brand vending machine that featured compartments for several product choices in a single unit. Using stop-frame photography, I shot sequences of the machines and later compiled the images into animations you see on the right. Taking the animation idea a bit further, I used a 3D modeling and raytracing engine to program falling M&Ms. The technique is sometimes referred to as flocking as the falling M&Ms behave like a flock of birds in flight. Then I combined the 3D rendering with stop-frame stills to produce the M&Ms animation seen above-left. Before the photo shoot phase of the project was complete, I needed a good picture of the Glock brothers. As I set up my camera and lights, the bothers left to put on something for the pictures. 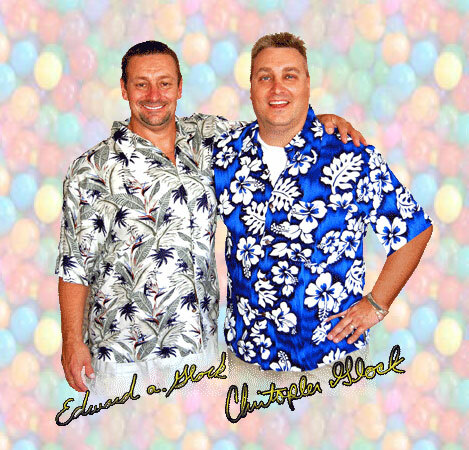 I honestly didn't know what to say when they both returned wearing bright colorful Hawaiian shirts. They started fooling around in front of the camera, and before we even began the photo shoot, I already saw the image I was after. I jumped on the camera and snagged the very impromptu shot of the Glock brothers you see below. The final product was written in standard HTML with some PHP calls. Glock Vending was created at a time when the content management systems we use today were not yet available. The Glock Vending project demonstrates the unique collection of skills under Vivid Vision's hat. The use of custom graphics, animations, 3D raytraces, on-site photography, HD video, and custom coding are just some of the skills brought to bear on the unique and one-of-a-kind products we produce.